After moving here to Vegas, I was introduced to homemade laundry detergent and the HUGE savings by two friends, Kelly and Angela. While my schedule never worked to go to one of their “laundry” parties, I secured a recipe and did a little more digging on my own and jumped right in. It works well and is SUPER cheap. My prices work up to be anywhere from less than a penny to $0.03 a load depending on how accurately I measure the amount that goes in the washer and the price of the essential oils I put in for smell. That is compared to about $0.11 a load for “All Free & Clear” WITH a coupon…about $0.14 a load without. “All” is one of the cheaper laundry detergents that I was actually pleased with the results from but, if you use something like “Tide”, your price can be upwards of $0.30+ a load. And yes, it can be used in front loading or top loading washers, HE or regular. Your prices of course will vary, depending on the washer…mine is based on a front loading HE washer. Since I have had several friends ask about the process, I decided to just make it easy and write a blog post about it. First, get your “stuff” together. You need…. Next, grate the entire bar of soap. Be sure not to get your nails or skin in the mix like I have a tendency to do. 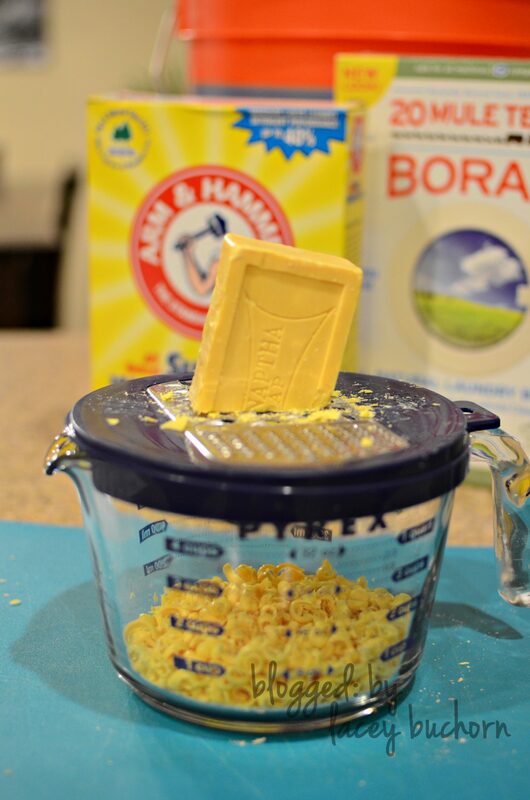 This will look like cheese, but will be a very rude awakening to hungry little fingers/mouths if you are not careful. 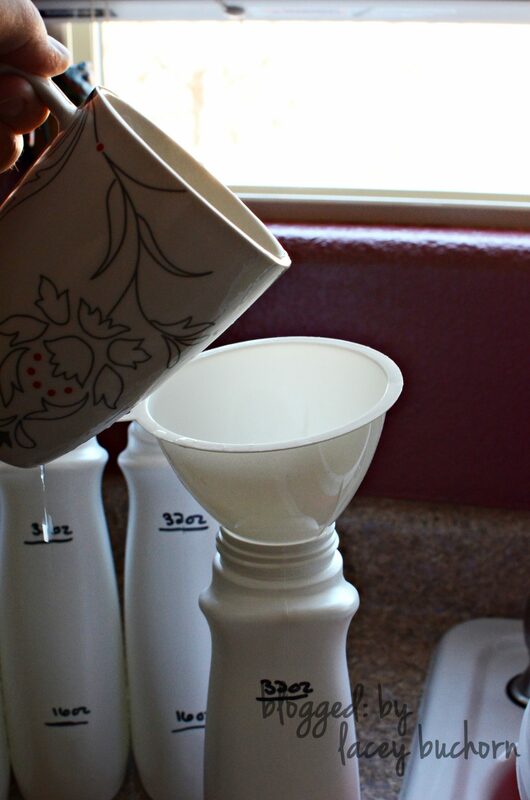 Measure out your Borax and Super Washing Soda so it is ready. Then, fill your bucket half full with hot water. 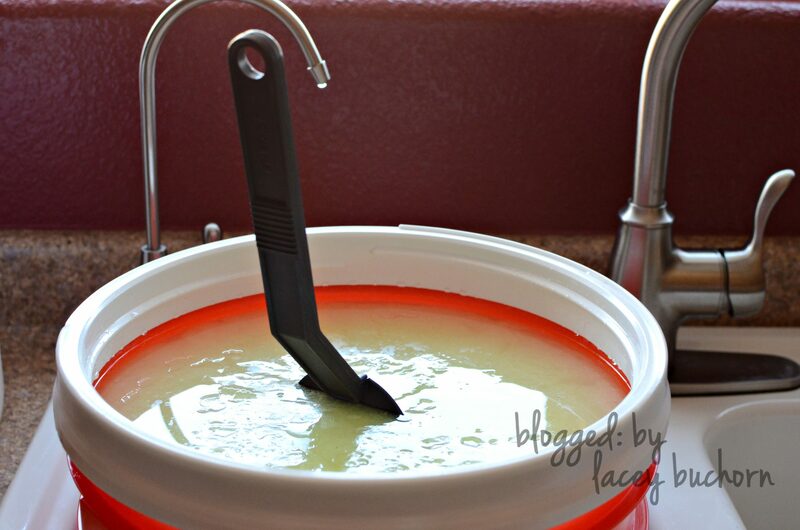 While the bucket is filling, melt your soap “curds” and 4 cups of water in a saucepan over medium-low heat, stirring regularly. 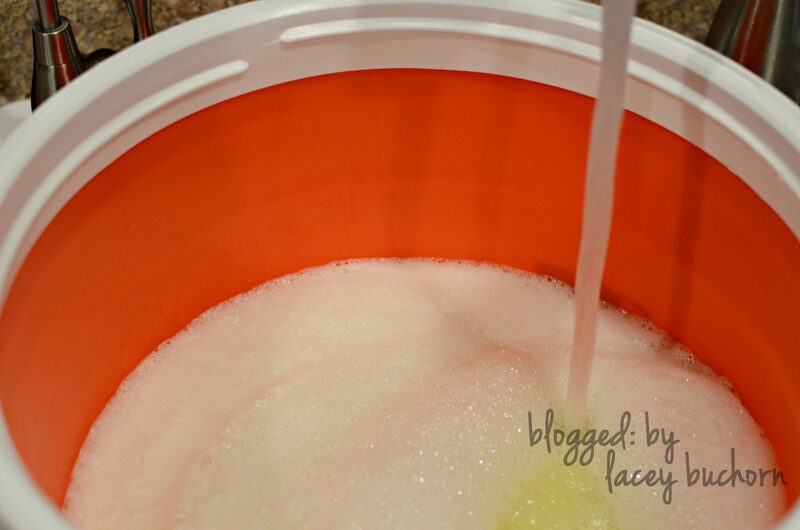 Add your soap mixture, Borax and Super Washing Powder to the half full bucket. 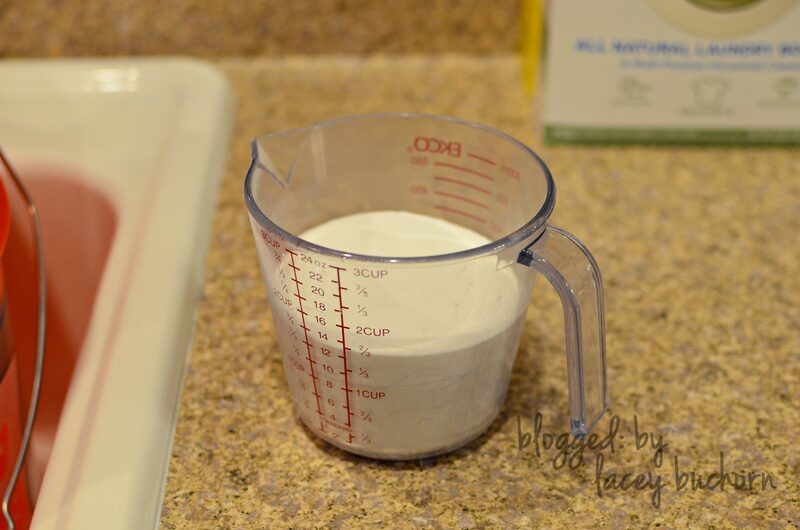 Stir until all powder is dissolved. 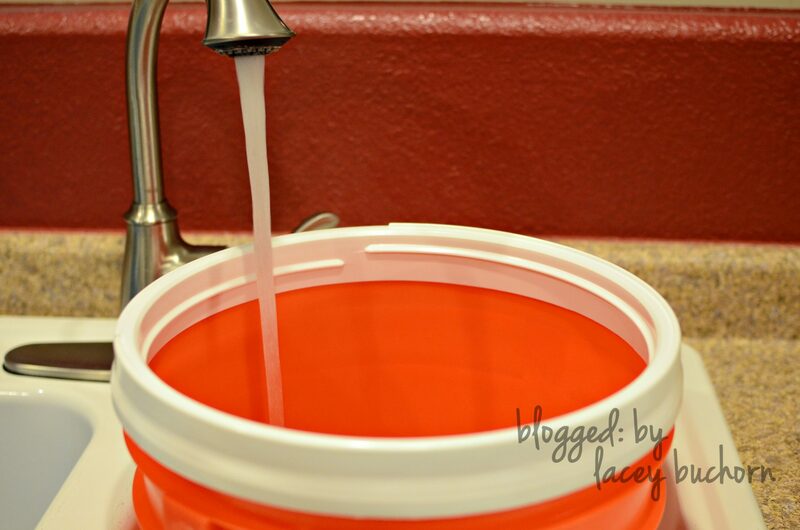 Finish filling up the bucket with more hot tap water. Cover and let sit overnight to cool and thicken. I just leave it in my sink at this point till morning. 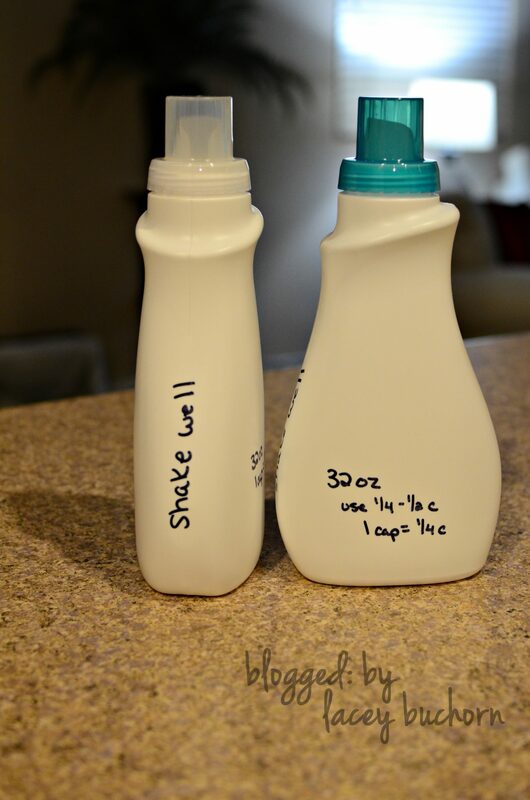 I mark empty laundry detergent containers with directions, especially “shake well” and measurements. It is really important to mark the half-way point and the full point of the bottles you choose to use. You’ll find out why in a bit. 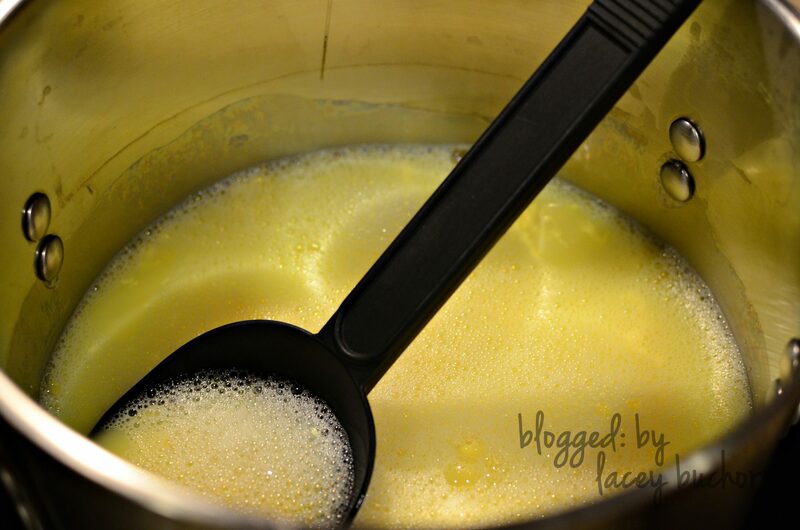 The next morning, open up your bucket and this is what it should look like….thick egg drop soup. In fact, it might be VERY thick. I usually use a heavy duty spoon, but I told Bryan last night that I plan to buy a paint stirrer that attaches to your drill before I make the next batch. Seems like it would be MUCH easier. 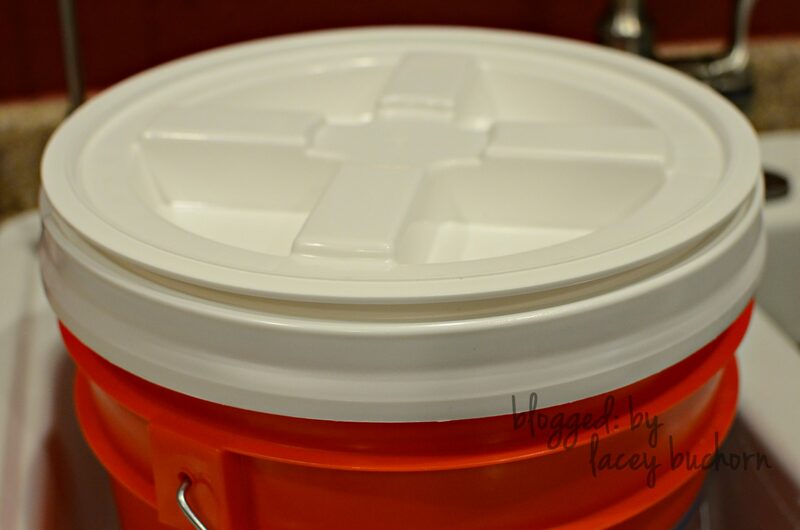 Fill your containers to the HALF-WAY mark with the detergent mix. I use a funnel, but if you have a steady hand, feel free to skip that part. 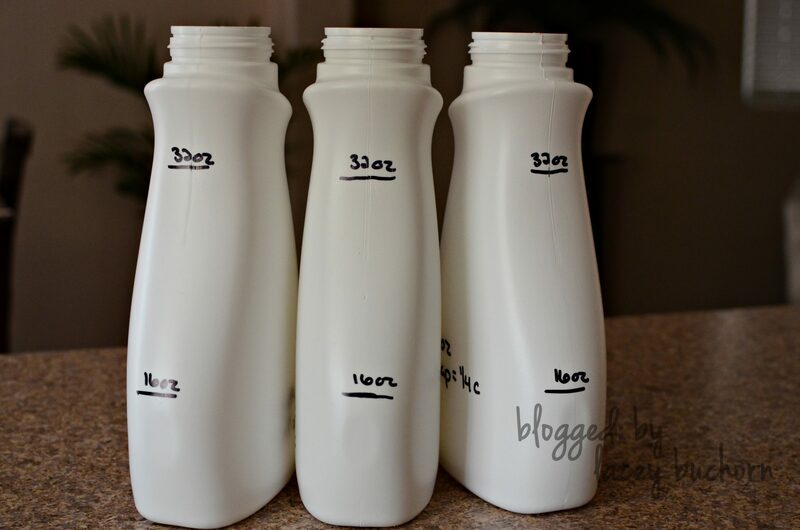 Then fill the rest of the bottle up to the full mark with water (see, this is the reason for the marks). This is not rocket science though and does not have to be 100% exact. Now, it is ready to use. At this point you can add essential oils if you would like. 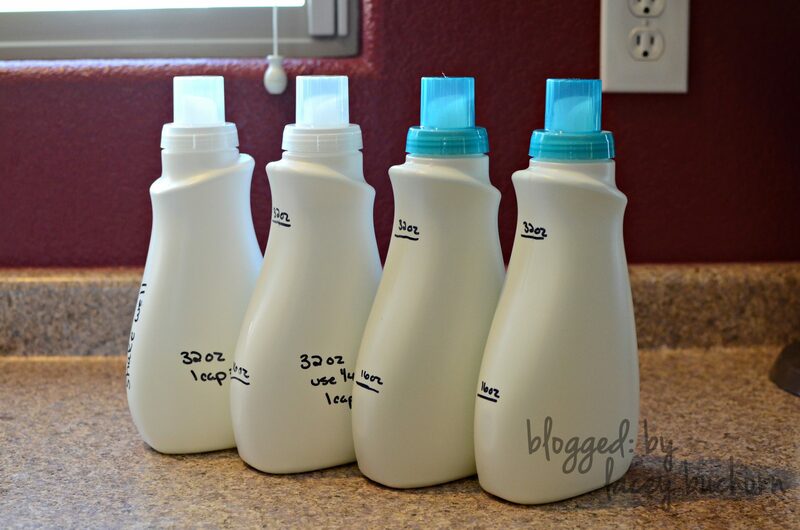 The essential oils simply give the detergent a “scent” like commercial detergents. Otherwise, it doesn’t really have a smell. Some people associate “smell” with clean, so your choice. 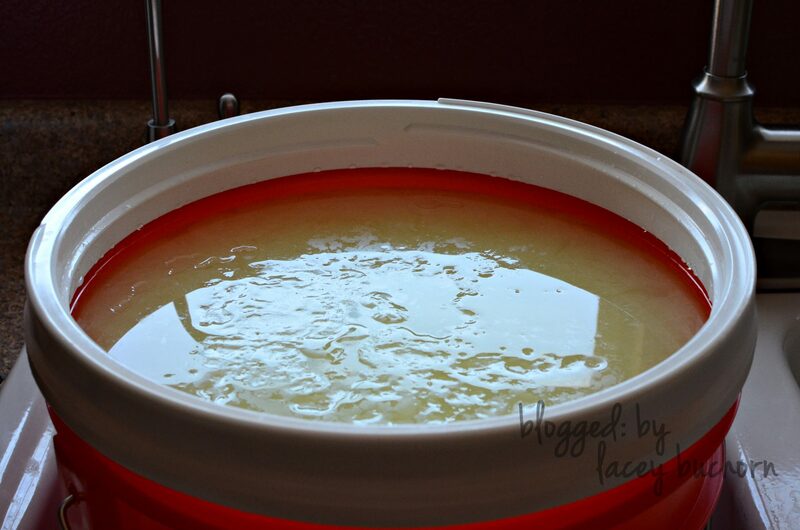 This mixture will gel when not used, so you MUST shake well before each use. I store the excess in the tightly sealed bucket (another plus of the gamma lid) out in the garage until I need to refill my bottles. The recipe is courtesy of the Duggar’s. They also have a powdered version here, but I have not tried it. I made a PDF of the directions and a few of my notes if you would like to have it. Download here (right click and save target as)…. Enjoy! If you have any questions, please don’t hesitate to leave me a comment or email me at the “contact me” link above. 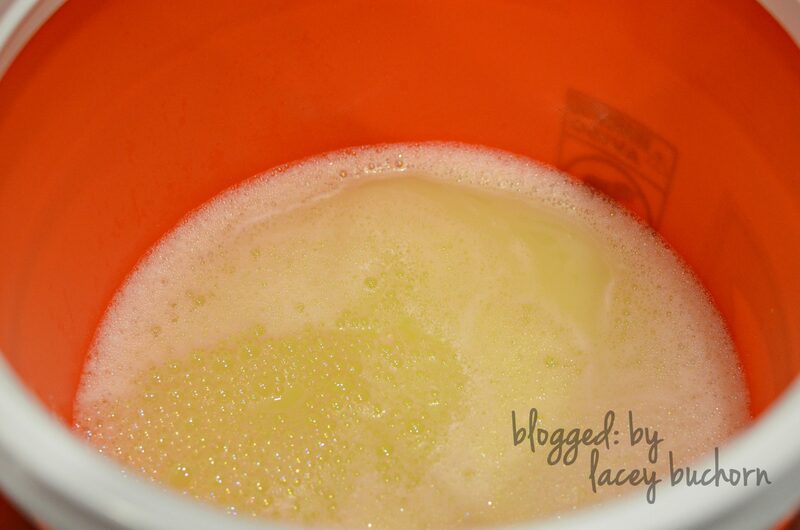 This reminds me of a blog post I did about homemade laundry detergent many moons ago. Looks like a similar recipe, although the ratios are different. 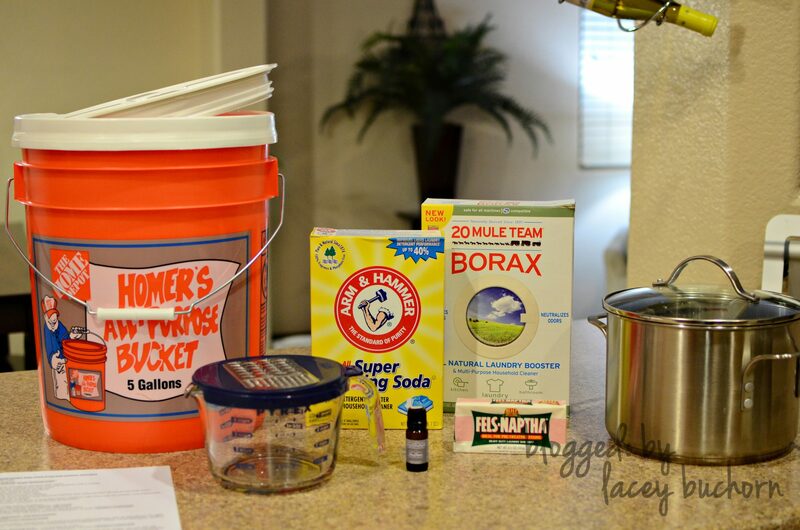 Mine uses a lot more borax and a touch more washing soda. I got out of the habit of making it, because of how crazy life has been. I should probably start again. I love that I can spend 30 minutes and have laundry detergent for AGES. No to mention the savings :). Did you use any oils for scent? I made this detergent a month ago and it seems that after several washings, the dirt and funk of my husband’s work clothes and my sweet sweaty little boy’s clothes has built up. The detergent is no longer getting rid of the smell in clothes. Any suggestions? I wish I had a good answer for you. 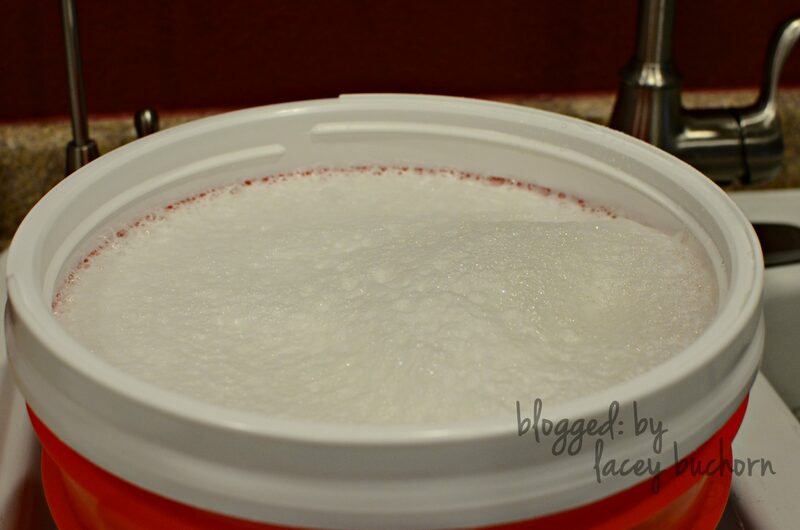 Have you tried tweaking the amount of detergent you add to the wash or the ratios of Borax/washing powder in the mix? 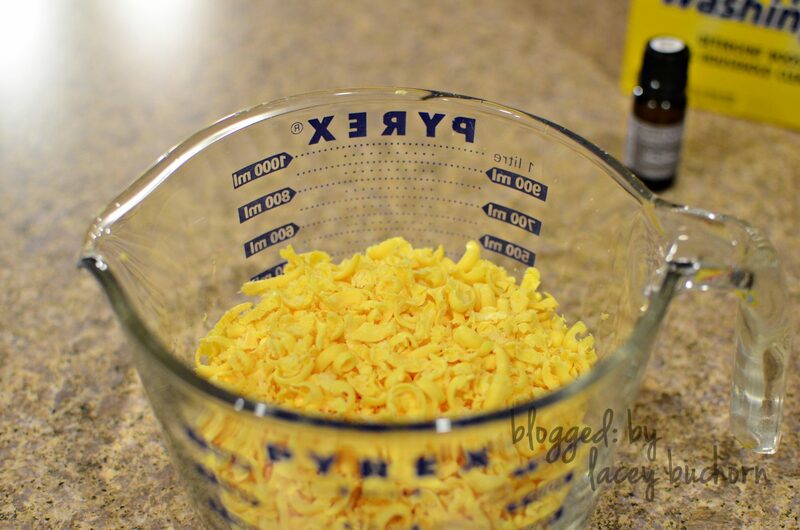 Do you use essential oils to add a scent? My husband being military is in combat boots 10-12 hours a day and it has managed to get that horrid smell out thus far.